What you see here is a state of the art high drive Caterpillar D7H. The D7 has traditionally been an intermediate sized machine. It is really too large to have the agility of the smaller machines, and properly should be thought of as a 'light weight' D-8. These machines typically are designed to weigh around 50,000 lbs. The general size design is based on the concept that within the United States it is about the biggest dozer that you can readily haul without either dismantling it or having a flock of overweight permits. People who really need a large dozer but have to compromise on size because of needs for the machine to be easily transported have often bought a D7 class machine. They are a good class of machine for pioneering and light road building. If there is serious dozing or hard rock to work, the bigger and heavier brothers to this machine are far more productive. The VanNatta's keep a Fiat-Allis 16B around for similar purposes. It is a competitively sized machine dating back to the lat 1970's. If you need to spread a load of rock, or scarify a piece of ground for forest regeneration or level off a landing, it is far more nimble at it, than the giant dozers are. 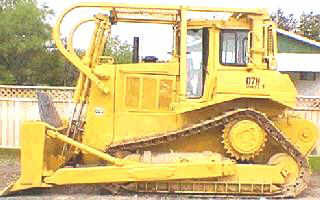 This size dozer is large enough to push something and small enough that you can see what you are doing. 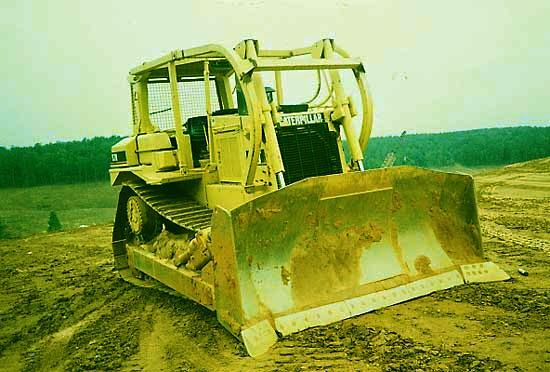 Unique among bulldozers is the high drive design shown in this photo. Caterpillar invented this design a number of years ago introducing it first on their largest machines and later on the smaller ones. As you can see the drive sprocket is elevated about the ground line. This has the disadvantage of proving one more place for the track chain to bend and presumably wear faster. This is critical because track wear is a very major operating expense on large dozers. Cat claims to have engineered around the problem with the development of sealed and lubricated (SALT) tracks in lieu of the traditional unlubricated steel on steel track chains of traditional times. There are a multitude of advantages to the design, however. It provides for a physical separation of the drive sprocket from the suspension. This means that the drive sprocket (the elevated unit) does not need to also support the weight of the machine. This functional separation means that the drive mechanism can concentrate on managing turning forces and the suspension can be designed for weight support. Most importantly, however, it gets rid of the dreaded 'final drive'. As long as their have been bulldozers there have been broken final drives. In the mid part of this century Caterpillar largely overwhelmed the domestic competition (Allis Chalmers, and International Harvester) due to the reputation of the others for broken final drives. The problem is that the drive sprocket needs to be relatively small in diameter to keep the ground speed down, but the dozer needs ground clearance. To accomplish this the drive train is mounted fairly high in the machine with the cross shaft exiting the sides of the dozer about where you see the "high drive" sprocket. In a traditional dozer there would be a small gear (a pinion) driving against a large gear (a bull gear) mounted below it which would provide the final gear reduction (hence final drive) and also the physical offset sufficient to provide the ground clearance. The problem with the little gear-big gear gear train is that the entire load of the vehicle is driven by a single gear tooth. the ability of a gear train to transmit power is a function of both speed and strength. The final drive by definition moves very slowly and must therefore be very strong. Every gear tooth must be strong enough to stall the engine or spin the track at a very low speed. Imagine the pressure developed on a gear when you take a diesel engine of several hundred horsepower, and run it through a series of speed reductions until it is down to just a few RPM and then concentrate that entire force on a single gear tooth. So what is the Solution. The engineers solution is fairly simple. Just get rid of the final drive. The planetary final drive is the better idea. It is inherently much stronger, because it has 3 or 4 (or more) planet gears circling a sun gear providing the gear reduction. This means that there are always multiple gear teeth engaged at any one time making the drive mechanism inherently stronger than the 1 tooth solution. The problem is, of course, that the planetary drive reduction does not provide a physical offset. With the high drive design this is not a problem. The planetary final gear reduction is contained within the drive sprocket (behind the massive bolt circle) and all is well. Now all this is not to say that the use of planetary finals is impossible in the traditional dozer configuration (with a low drive sprocket). Indeed a number of models incorporate this feature, and in fact the Fiat Allis 31 shown on the bulldozer page has a planetary final drive integrated into the final drive bull gear. This means that the big-gear little- gear offset is ( I guess) not really a 'final drive' but a 'next to final drive'. This helps but the machines still scrunch final drives now and then though not badly. The other good news of the elevated sprocket is simply maintenance. When that last gear train ultimately does need help you can undo that bolt circle visible on the sprocket and fix it. To access the final drive in a traditional dozer Such as the Fiat Allis 31, it takes determination. You have to break the track, disconnect the swingframe and elevate the dozer above it and pull the sprocket to get to the final drive area. This is all easier said than done. Breaking the track requires a 100 ton port-a-power. Removing some of the large bolts requires a 1 1/2 inch drive impact wrench ( the more common 1" drive impact wrenches don't cut it), and elevating one end of a 50 ton machine is no trivial task in itself. Of course, on a Smaller dozer the pieces are smaller but the principals are similar.